The Samui Crocodile Farm is not a zoo, there are some token animals to fill the place out, but essentially it's about crocodiles and snakes. 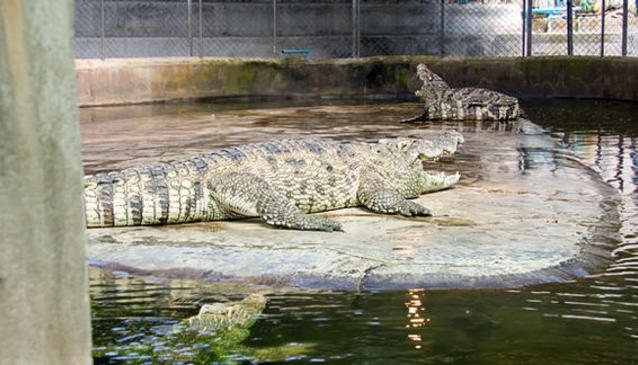 You can view various species of crocodiles in basin enclosures and likewise snakes native to Thailand. The whole point of visiting the farm is not really about animals in enclosures, but the 2 very excellent shows performed by the fearless reptiles and trainers. The first show begins with crocodiles at midday, then alternate between snake and crocodile every hour until 5 pm. At crocodile show time guests are ushered through to an undercover area with a fenced enclosure containing 4 primitive beasts varying in size and age. The two hosts, Hin and Sean join the animals and talk guests through some crocodile facts while carefully manoeuvring the reptiles on to a concrete slab. Here they do some dangerous and very entertaining stunts with the crocodiles, including sticking their heads between the powerful jaws of the creature. For those that might think these animals are highly trained and the risk is minimal, have a chat to Hin after the show. He has many visible scars and actually lost a thumb.The crocodile show runs for about 45 minutes. After a 15 minute interlude, guests are once again ushered through to the snake pavilion behind the crocodile show area. Your 2 fearless hosts Nicky and Chet will talk you through a variety of indigenous snakes as they are paraded only metres away behind a plastic performance area. You also get to view them up close and touch them if you like. The show really warms up when the extremely deadly Samui natives are brought out to play, the Monocellate Cobra and King Cobra. The brave young Nicky proceeds to taunt the snake in to striking within millimetres of him multiple times. Not satisfied with one, he eventually does it with 3 of them. One man and 3 Cobras all standing to attention ready to strike is fun to watch. The most dramatic part of the show is when Nicky decides to give the snakes a kiss on the lips, without any grip or hold on the snake, basically at it's mercy. The Samui Crocodile Farm is great alternative entertainment for an afternoon and surely one that will last in the memory of the kids. The price for entry is 500 Baht per adult and 250 per child.